If you’re thinking about investing in a new box spring, you may have already heard the term “low profile,” and are wondering what it means. In this guide, we’ll provide an in-depth answer to that question, along with reviews and rankings of some of the top sellers in the field. First things first: What is a low profile box spring, and how does it differ from a standard model? While a regular box spring measures in at a standard 9 inches, their low profile counterparts are generally no thicker than 5.5 inches, and sometimes as slender as 4 inches. The height difference is virtually the only thing that sets the two apart; a low profile box spring will provide the same amount of support and protection as a standard one. In this section, we’ll take a closer look at some of the leading brands on the market, and discuss what distinguishes them from the competition. The steel construct of this bi-fold platform gives it the heft it needs to make up for its thinner-than-average construct. It’s suitable for any type of bed frame or mattress, though some thicknesses may be better than others (see the customer response below for more details). Available in twin, full, queen, split king, and split California king sizes. Customer response to this box spring has been mainly positive, with testers praising its sleek construction and noise reduction factor (i.e., it doesn’t cause squeaking). Setup is also relatively easy–it can be a tad bulky to unload, but once it’s out of the packaging, it’s not difficult to maneuver. A few consumers noted that if you already have (or are planning to buy) a low profile mattress as well, the overall effect can be too low–particularly for anyone who wants to sit up in bed to watch television or read to little ones. This product, which bills itself as a “replacement” model, also measures in at just 4 inches, as evidenced by the slim, maneuverable packaging. The base is nonetheless strong and sturdy, constructed of smooth wood, and simple to put together. Billed as “noiseless,” this USA-made foundation is available in seven sizes: twin, twin XL, full, full XL, queen, king, and California king. While the wooden construct had some testers worried about splinters, it’s sanded smoothly enough to alleviate these concerns. Assembly is easy, and the fit is snug and secure. A vocal minority claims that the bed is noisier than advertised once it’s all put together, but others say that it won’t squeak as long as the assembly instructions are followed properly. Unlike its bi-fold counterpart, this Zinus foundation is constructed out of wood, but it also measures in at a narrow 4 inches, making it a great choice if the mattress is high profile and you need to make up for the height difference. Foam padding around the edges helps contribute to noise reduction, and it can be put together in less than an hour. Size selection is fairly limited, with only twin, full, queen and king models available. Testers praise the quietness of the model, along with the natural comfort and eco-friendliness of the construct. 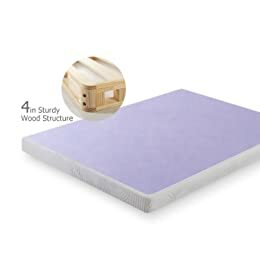 It’s an especially good fit for memory foam mattresses or hybrids, as the solid foundation provides excellent all-around support. As the name suggests, this box spring can also double as a bed frame for those who prefer to sleep extra-close to the ground. 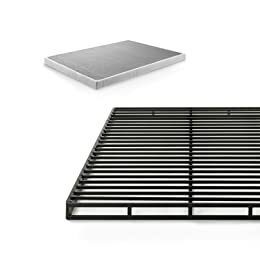 The steel slats are tightly spaced, making it suitable for all types of mattress construction. Packaging is compact and maneuverable, and the “Quick Lock” construct makes assembly a snap. This model is available in twin, full, queen, and king sizes. The steel frame reportedly provides excellent support, a feature that’s especially appreciated by customers who carry a little extra weight. 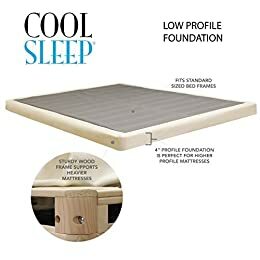 It’s also highly recommended for those with disabilities or special needs, particularly when used as a frame for a similarly low-profile mattress. This instant foundation–measuring 4 inches thick–can be folded for ease of storage, which makes it handy for dormitory or short-term apartment living. It can easily support all mattress types, and the construction makes it noise-free. Available sizes include twin, full, queen, and king. Consumer response is positive across the board, with testers praising the sturdiness of the frame, particularly for this type of low profile construct. Since it arrives in a single piece, much of the assembly is already taken care of for you, something else that testers appreciated. Our Lifetime entry prides itself on being the perfect fit for heavier mattresses, including those with memory-foam construction. Like the Classic Brands foundation, it’s made of wood, so it’s eco-friendly. Lifetime advertises a 15-minute assembly for this product, but testers report that it takes slightly longer–more like half an hour. Models are available in twin, twin XL, full, queen, and king. Testers also mention the sturdiness of the product, to the point that some expressed concern about it being too heavy to manipulate alone. Note that while it’s advertised as a “box spring,” there are not, in fact, any springs (this is also the case with many of the products on this list, but they’re usually double-billed as “platforms”), just a solid support system for your mattress, at a decent price. 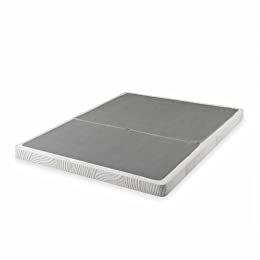 Continental Sleep enters the ring with a 5-inch mattress foundation, a height that offers the best of both worlds–it’s low enough to pair well with another low profile mattress, but can hold up to a sturdier one as well. It’s also available with a bi-fold construction, similar to the one offered by Zinus, to make storage simpler. The size chart is one of the most versatile on our list, with twin, twin XL, full, full XL, queen, king, and California king all on offer. No testers found fault with either the sturdiness or the quality of the material, but it was noted that the split construction doesn’t always line up perfectly, making for a somewhat awkward night’s sleep. Keep this in mind if you intend to order one of the bi-fold models. 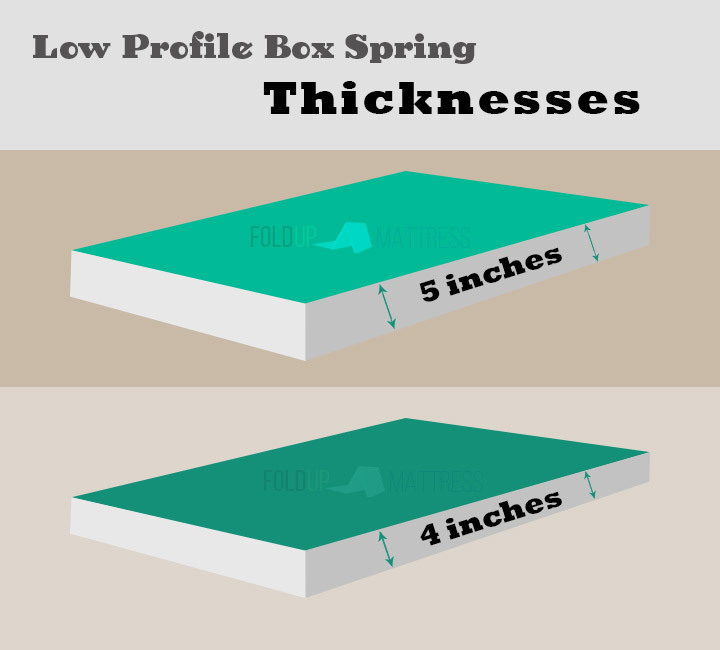 Why should you get a low profile box spring? For that matter, why invest in a box spring at all? 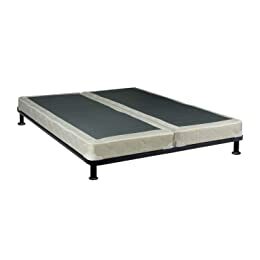 As you likely surmised from the Product Review above, the construct of some mattresses makes it possible for them to sit atop a platform, with no additional support required. 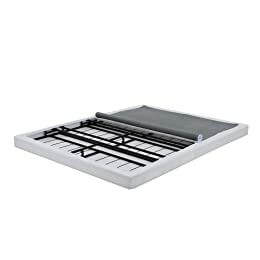 So if you already have a bed frame, is there any point to the box spring? The answer is a resounding yes. The support and stability that they provide are invaluable, but that’s only one factor to consider. A box spring gives extra height to the bed, making it easier to get in and out. They may also extend the life of the mattress due to the additional shock absorption, thereby reducing overall wear and tear. For information on why you should invest in a low profile model as opposed to a standard one, see Low Profile vs. Standard, below. As mentioned above, the difference is all about height and thickness. A low profile box spring measures about half as thick as a standard model. So who are the best candidates for this product? 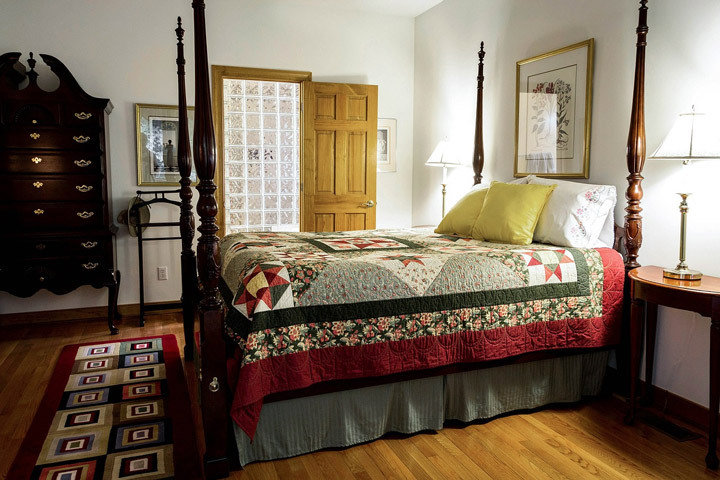 If you’re a person of smaller stature, you’ll likely appreciate the ease and comfort of a bed that sits lower to the ground. Likewise, the elderly or anyone with mobility problems should consider switching to low profile as well. The dimensions of the room in question should also be considered. If the ceilings are low, then the lower frame would work better on both the aesthetic and practical levels. What size box spring do I need (twin, full, queen, king, or other)? What is the maximum height I want the bed to be when the box spring is added? 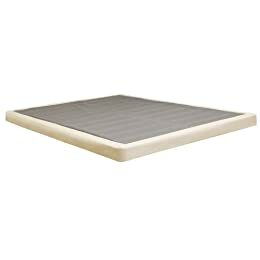 What materials would work best for the type of mattress I have? Will I be able to assemble this myself, and if not, do I have adequate support to help me put it together? Will the box spring be too difficult to maneuver, should I need to move it? Will I need to invest in a separate cover? Once these questions are answered, it will be easier to choose from the list of available products. If you choose to read through the customer comments, bear in mind that what worked or didn’t work for one consumer may not be the best reflection of your own needs. Now that you’ve learned a little bit more about what a low profile box spring is, and why you should consider this foundation style, it’s time to start shopping. With any luck, these tips and guidelines will serve you well in your search for a more restful night’s sleep. Best of luck, and sweet dreams!